The DNA of a cave girl who lived about 80,000 years ago has been analysed in remarkable detail. The picture of her genome is as accurate as that of modern day human genomes, and shows she had brown eyes, hair and skin. The research in Science also sheds new light on the genetic differences between modern humans and their closest extinct relatives. The cave dweller, a Denisovan, was a cousin of the Neanderthals. Both groups of ancient humans died out about 30,000 years ago, but have left their mark in the gene pool of modern people. The Denisovans have mysterious origins. They appear to have left little behind for palaeontologists save a tiny finger bone and a wisdom tooth found in Siberia's Denisova cave in 2010. Though some researchers have proposed a possible link between the Denisovans and human fossils from China that have previously been difficult to classify. 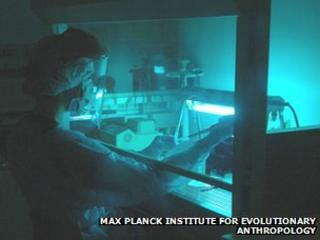 A Russian scientist sent a fragment of the bone from Siberia to a team led by Svante Paabo at the Max Planck Institute for Evolutionary Anthropology in Leipzig, Germany. He thought it might belong to an early modern human, but the results came as a surprise. DNA analysis revealed a human who was neither a Neanderthal nor a modern human but the first of a new group of ancient humans. Dr Paabo's team has now sequenced the genome of the Denisovan in much greater depth, using a new technique for studying ancient DNA. The quality of the genome sequence is similar to that seen in genome studies of modern day humans. "This is an extinct genome sequence of unprecedented accuracy," said Dr Matthias Meyer, the chief researcher on the study. "For most of the genome we can even determine the differences between the two sets of chromosomes that the Denisovan girl inherited from her mother and father." The scientists compared the girl's genome with that of Neanderthals and 11 modern humans from around the world. This allowed them to catalogue the gene changes that make modern humans different from the two groups of extinct humans that were their closest relatives. They include changes to only a single DNA letter in several genes involved in the wiring of the brain and nervous system, as well as those that affect the eye and the skin. Dr Paabo said further investigation of changes in genes involved in connecting up the brain will be exciting to pursue. He told BBC News: "To me the most exciting thing is having a good genome from our very closest extinct relatives which we can now compare ourselves to. "It's a catalogue of what makes everyone on the planet unique compared with our closest extinct relatives." The most detailed genetic analysis yet of the Denisovans also confirms that they bred with the ancestors of some people alive today, the researchers said. It shows that about 3% of the genes of people living today in Papua New Guinea come from Denisovans, with a trace of their DNA lingering in the Han and Dai people from mainland China. The genetic variation of Denisovans was very low, suggesting that although they were found in large parts of Asia their population remained small.